by five children and their spouses, 17 grandchildren, eight great-grandchildren, and two siblings. “Robin” Bush; and his brothers Prescott and “Bucky”. the spread of market capitalism, and the opening of closed economies. neighbors together in face-to-face discussions for the first time. feuding warlords that had precipitated a famine. guided America’s environmental policy for more than two decades. The education summit Mr.
discretionary spending by Congress while cutting the deficit by historic levels. daughter, Robin, from leukemia on October 12, 1953. First Tee program from 1997 to 2011. Florida, Puerto Rico and the U.S. Virgin Islands. public service, his most important legacy. elementary and high schools in Texas were named for the former president. The USS George H.
China (1974); and Director of Central Intelligence (1976). deployment of Pershing II missiles in West Germany – a critical turning point in the Cold War. said, concerned about the worrisome impact such an irregular sight might have. 64 years old when he took the Oath of Office on January 20, 1989.
encouraged the 1942 graduating class at Phillips to forego military service and enter college. landings and 58 combat missions. He was awarded the Distinguished Flying Cross, and the U.S.
of Japan and the Persian Gulf. 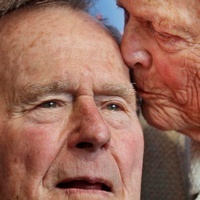 Moving to Houston in August of 1959, the Bushes joined St.
Martin’s Episcopal Church where Mr. Bush served as a vestryman from 1965 to 1968.
children and, later, his grandchildren were active in their communities helping others. reveled in driving his motorboat at high speeds and entertaining an endless procession of guests. He made seven post-presidential parachute jumps, the most recent of which took place at St.
occasionally engulfed politics during his lifetime, he considered public service a noble calling.